The Modern Woodmen of America chose us Our Boxers, Brews and BBQ fundraiser for their Matching Fund Project. We were awarded $2500.00, the maximum amount. 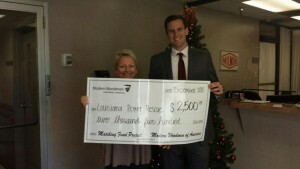 Many thanks to The Modern Woodmen for this generous donation!